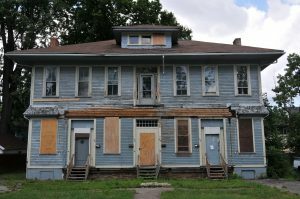 In February, young preservationist organizations across the rust belt – in cities like Pittsburgh, Buffalo, Columbus, Cincinnati, Indianapolis – gather to show their love for old buildings in need of some TLC. On February 9, the Young Urban Preservationists (YUPs) convened at the Driving Park Hotel in the Maplewood neighborhood of Rochester, NY. 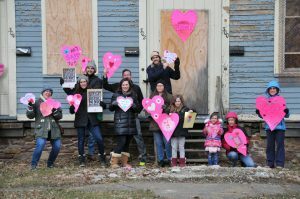 A phenomenon created by Buffalo’s Young Preservationists, heart bombing is a fun and festive way to draw attention to vacant buildings and to the potential that these buildings have to serve as community assets rather than eyesores. The process is simple: you gather all your favorite crafting supplies (construction paper, doilies, glitter, markers, etc.) 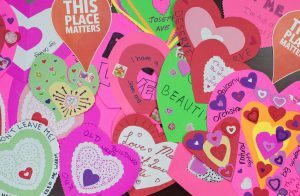 and your favorite preservationists in a room, make valentines for needy buildings, then go out and tape those valentines to the building(s) in question or just hold them up, take lots of pictures, and post those pictures to social media. The YUPs put their own spin on heart bombing by making the event a family affair. 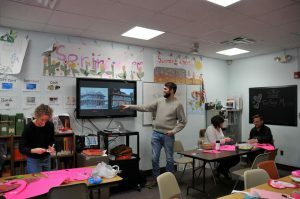 The day began at the Maplewood Community Library where kids could learn about preservation and how vacant buildings can be transformed into community assets. Then, they created their own hand-made valentines! Built in 1874, the former Driving Park Hotel is the last remaining structure from the Driving Park Racetrack, which operated from 1874 to 1902. The Racetrack was a sprawling campus of some 84 acres which included, in addition to a mile-long oval track, grandstands capable of seating 10,000 people, horse stables, administrative offices, and the hotel for visitors from near and far. Once known as the fastest mile in America, Rochester’s Driving Park hosted nationally famous performers including Buffalo Bill Cody and renowned business leaders such as William Vanderbilt, many of whom stayed at the hotel. What structures were not lost to fire in 1899, were demolished in 1902 to make way for the homes seen today—all except for the former hotel at 298 Selye Terrace. Today, the Driving Park Hotel is vacant and, due to unresolved code violations from its current owner, HSBC Bank, has been placed on the City of Rochester’s demolition list. The property is currently for sale; a rehabilitation would require a substantial investment. To see heart bombing in action all over the Rust Belt and the rest of the country, search #IHeartSavingPlaces on Instagram. We hope you’ll continue to show your love for historic buildings all year long AND join us for next year’s heart bombing!